Big Left Media, Lies, and Pro-life…. Very much in tune with “life, liberty, and the pursuit of happiness”, one gets the impression that the (seemingly “HUGELY”) ever-expanding Trump family bear a remarkable resemblance to another former occupant of the White House and HIS family. By all appearances, Trump daughter Ivanka has her priorities right and her head screwed on straight. The extended Trump family is truly amazing. 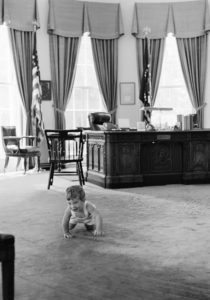 Which reminds of someone else who learned to crawl in the White House, and in the Oval Office at that! … Check out this pic as a for-instance. As for the liberal progressive Big Left Media, their bias was in full control mood as they shone the bright light of unending coverage on the despicable and deplorable, while completely ignoring the sane, the sound, and well-behaved. Madonna surrounded by pics/outfits of vaginas, talking about blowing up the White House, and by the time they were done, everything was left a total mess for others to clean up. The March for Life movement on the other hand, stayed on topic, didn’t fling around hatred and talk of killing others or make any derogatory statements. And when they were done, they policed themselves to make sure the area was clean, just as they found it. A stark contrast of the mindset of each side. Note the vast difference in contrast between last week’s Women’s March on Washington, and that which took place Friday. Last week was nothing more than a display of anarchy, twisted perversion, and the out-and-out waywardness and demonic disregard shown to innocent babies in the womb. In the March for Life women’s gathering however, we were witness to heartfelt decency, respect, and love for the innocent occupants of a mother’s womb. Abortion prevents the life that might have been. Who knows the loss of the genius that could’ve blessed society with cures for disease, or wisdom to stop wars. Since Roe v Wade in 1973, even the Supreme Court is guilty. What part of “Thou shalt not kill” don’t they understand? Which leads us very much to the heart of the matter, and that is the propensity of lies, lies, and fairy tales which emanates from the lamestream Big Left Media on a daily basis. Enter former presidential candidate Herman Cain to set us straight. Remember that the Big Left Media was the propaganda arm of the Obama White House and the DNC for 8 years. Their boss in the White House is gone, having basically wrecked the Democrat Party and they’re left to shill for a gutted DNC. A bitter pill indeed. Now that the Democrat party has destroyed itself, the lamestream Big Left Media personalities are attempting to fill the void officially, basically forming their own unelected party, having highjacked the airways in opposition to President Trump. But the plug and funding have been cut on the propaganda machine. It’s running on an emergency back up battery which no one has any intention of replacing. The Democrat party is no more. Leave a reply on "Big Left Media, Lies, and Pro-life…."